Mailout is known to be the cheapest channel of conveying information about your company to customers. Using specialized services allows sending a large number of personalized e-mails, without spending lots of time on it. One of the market leaders in this sphere is MailChimp e-marketing service. 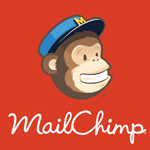 This article describes how SugarCRM integration with MailChimp can benefit your company. Preparation of a mailout may be quite time-consuming if done manually. That is why many marketers consider such an activity to be a real chore. Just imagine creating a number of personalized e-mails while adjusting each one to a particular person. However, with an advent of e-marketing services, this is no longer a problem. Now the program can itself choose a contact from the pre-arranged database (e.g. 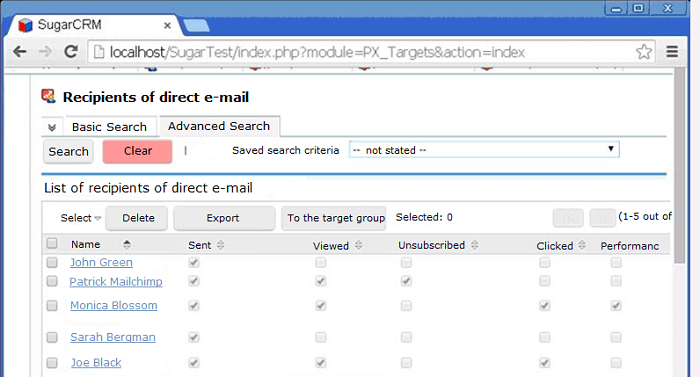 SugarCRM contact base), fill in all the corresponding data in the letter, and run the mailout. The only thing left for a marketer to do is prepare the template of a letter and sync the contacts. The solution became so popular thanks to low tariffs and powerful functionality that allows preparing letters, easy to read both on computers and on mobile devices. 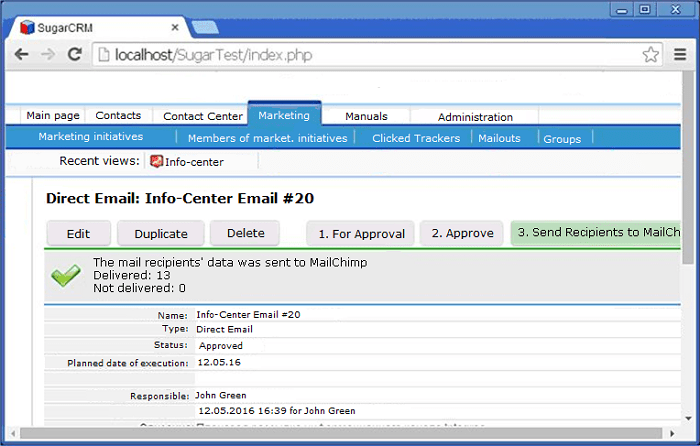 How to ensure flawless SugarCRM integration with MailChimp? For many business users, it is crucial that a CRM system has marketing tools for the analysis and accounting of customer feedback. 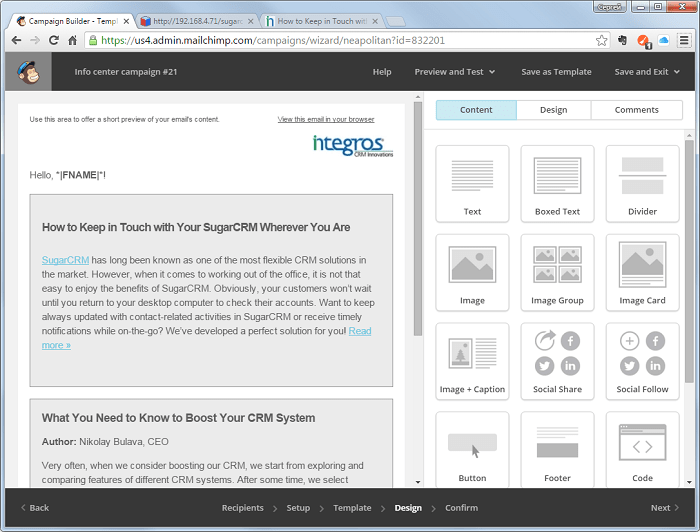 To this end, Integros LLC developed a connector between SugarCRM and MailChimp e-mail marketing service. 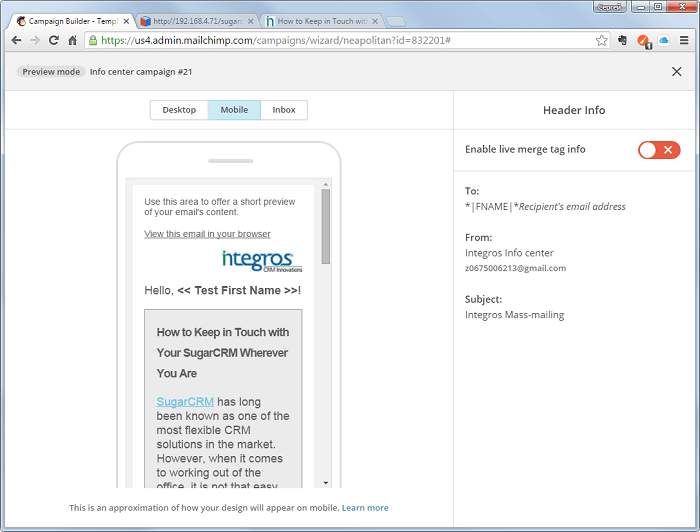 Sending a mailout through MailChimp to recipients from SugarCRM customer base. Segmenting the customer base according to the customer profiles in SugarCRM. This way you can designate which letter to send and who will be the recipient. Showing mailout results in SugarCRM account history. After that, prepare a template and contents of the letter and start the mailout. The analysis of the mailout will prompt you of how to further work with the client. The customer’s following the desired link may be a good reason for your manager to call them or send a letter specifying the details of a product. 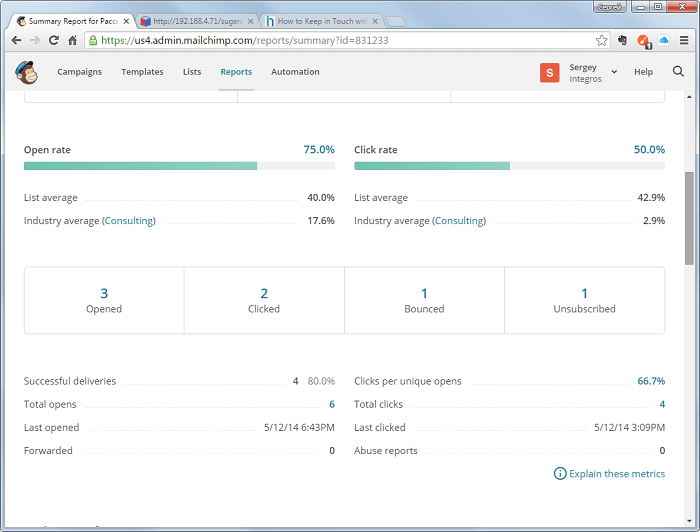 What benefits will SugarCRM integration with MailChimp bring to you? MailChimp saves a considerable amount of time that could be spent more efficiently, thus optimizing the operation of a marketing department. The functionality allows compiling useful analytical reports, which help evaluate the effectiveness of a mailout and decide how to continue to work with a customer. Thanks to the analysis based on MailChimp, marketers will be able to assess previous mailouts and make amendments so as to achieve a better response, and, consequently, attract more leads in the future. Should you come across any issues with SugarCRM integration with additional tools, do not hesitate to contact us. Our experts will be glad to help you.